The up/download data rates are available as 2-line items (with a half-height font). Neat. Thanks Hadogen. And the alias name of a bluetooth devices is used instead of the device name if the user chose one. And an embarassing bug: the midnight alarm was only scheduled one (as consequence of the fact that Android does not allow repeating alarm events that are exact). Sorry, Rick. fixed crash if “Show airplane mode icon” is selected, but the READ_PHONE_STATE permission not given. Thank you, Aaron! 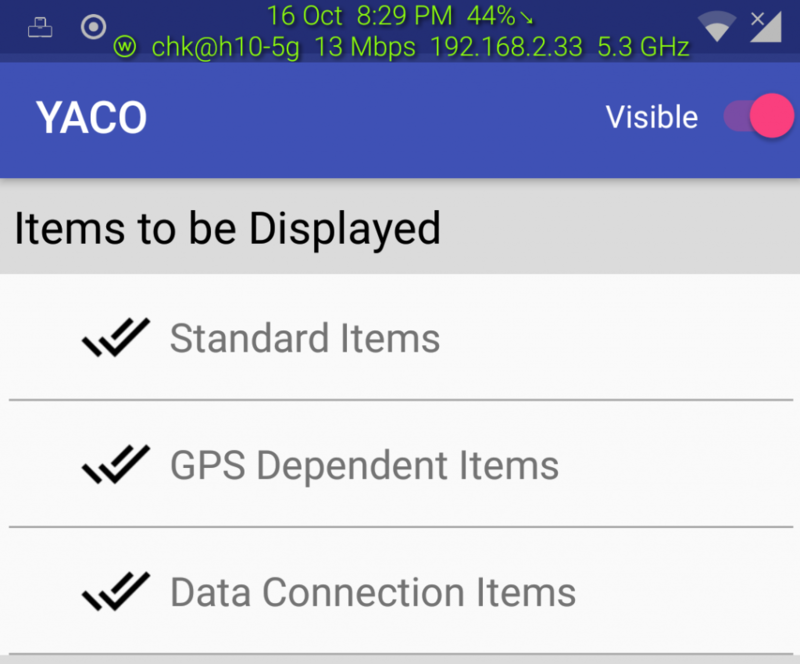 Dual SIM: option to display an “inactive” SIM card – this allows to monitor the signal strength of the second SIM and to evaluate whether switching the SIM would improve the data connection quality. internal version with Picture-in-Picture display in car mode, but it is not meant for that kind of usage and gets confused. Perhaps I will try later, it looks nice. Anyway, I don’t need the system’s implementation for that, so I can also skip the Oreo code and do some DIY job. At first, it looked like it could do the job, and I like to try new technologies. when the phone’s display was off when the Wifi disconnected, there was still some code running that checked the Wifi data rate even if it was not connected any more using Wifi… nothing serious, but CPU waste. todo: the “which also cares that the device does not start to sleep” of the car overlay does not work as expected, need to find a different way. YACO did crash when a device without GPS was used (who would have expected someone would install it on a TV? ;)) Thank you, Jaromír, for the report! I apologize for 2 updates on the same day, but I like the users to be happy with as little problems as possible! refactored the inner workings from intents to interfaces that clients can hook to, resulting in much, much cleaner code. Found several bugs in the meantime, and unfortunately I’m sure I added new… the fate of software developers. known bug: Oreo causes the YACO overlay to be gone in the morning, most likely due to some DOZE effects. Oh well. Not found the cause yet. 1.7.0: large update… the switch to Oreo caused a lot of bugs, sorry. Refactored some internal code to simplify it. new notification icon and app icon – I hope you like it! for Oreo: the SYSTEM overlay does not work any more (see Android O is Breaking Apps that Overlay on top of the Status Bar), there’s a new option to place YACO below the status bar. Sigh. This change breaks a lot of applications. while I was at it: fixed problem of slider painting over itself (actually, two sliders on top of each other) – a customer reported the problem in ‘Personal Sunrise’, and now I was able to reproduce it in the Oreo Emulation Machine. Thanks, Walter! fixed Notification Channels for Oreo. As I do not have an Oreo device (just the emulators), I am very thankful for any report about strange behavior or improvement suggestions! fixed Oreo at all… ;( Too many “innocent” changes. Also, YACO placing on top not puts it below the standard icons of Oreo, thus the text is not readable any more. Time for a new Smartphone operating system that is less restrictive. workaround for Nexus 7 bug displaying “NOT CHARGING” arrow instead of DISCHARGING. removed test code for weather provider – it makes no sense as displaying a weather forecast in 5 icons it not very informative. Saves 500 MB of code. … and proguard in combination with code and resource shrinking does cause crashes on startup due to missing resources. Sigh sigh. an issue of the Android Developer Studio could have caused devices with Android < 5 (Lollipop) to crash. Sigh. Displays active devices on Always-on-Screen (Samsung) – very valuable as I think. Only those devices are shown that are switched on in the “active devices” section of the standard item group. A blue filter (“red filter”?) for relaxing in the evening, fixed with sunrise/sundown times of your location. Not as good as the built-in ones (cannot be, unfortunately), but Samsung (S8 at least) it is more than imperfect as it needs an enabled GPS for the sunrise/set times – it DOES NOT remember the location! used the profiler a bit and improved CPU load – less battery usage! … and a few more bugfixes. Never allow Google to suggest a new Development Environment version: 1.6.1 crashed when the colors could have been chosen as the whole build process and some libraries did change unexpectedly. added fixed unit dimension for data rate – easy to miss it’s MB instead of GB. So a single unit can now be selected. 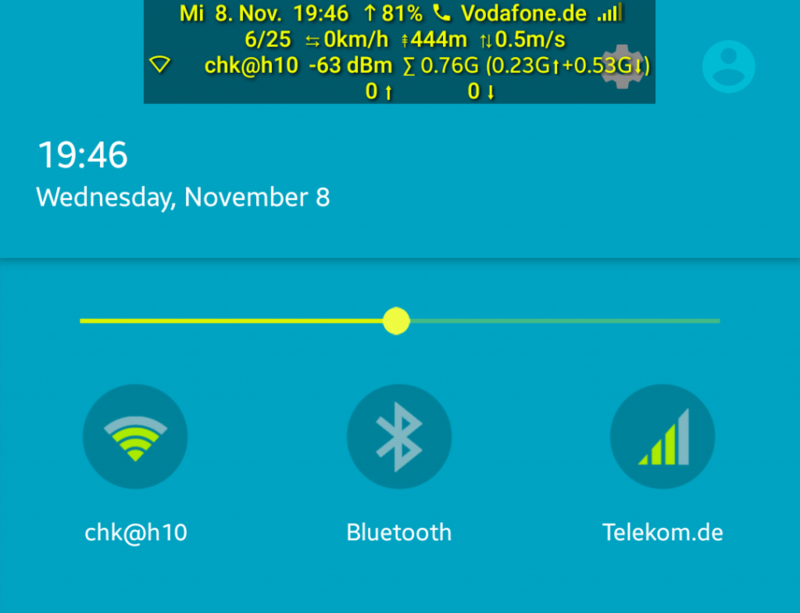 Finished Connection data, added global data consumption and other goodies, tethering and VPN detection, … The work is worth it! Added an action (vibration and/or LED lighting if the device is connected or disconnected). Sounds superfluous, but when the QI wireless station is small and it happens that the device is not 100% correct on top of it that it it not being loaded. Now I feel when it’s correct. 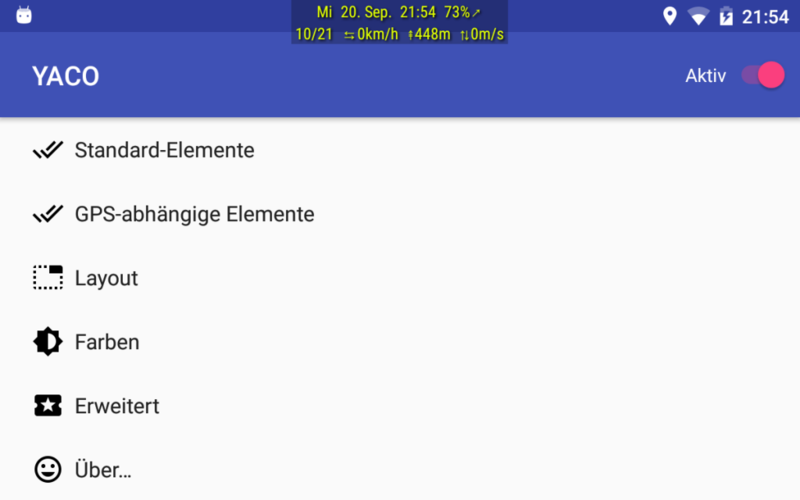 Mobile: Type of Connection (EDGE, HSDPA, …), Roaming State, Provider Name. As I own a DualSim device, this is also supported (Android >= 22). while sitting in a plane flying home (thanks EasyJet ;)), I missed permanent GPS information, so I added a line with optional GPS information (height, speed, satellites used in fix, and climb/sink rate).Unfortunately now YACO needs GPS access permission, but this only really disturbs when installing on pre-Android 6-devices, otherwise it is queried when one of the new options is activated, and does not irritate the user when he wants to install YACO. fixed layout problems if the character count or widths changed (from 9 to 10 o’clock or such) – thank you, K, for your patience finding that problem! battery load state is now an arrow instead of a ‘+’ or ‘-‘. detects (user) changes in time format, time zone, time value – immediately reflects the changed option. fixed time format error when the time format was a 12-hour time format and YACO was started at an 12-hour value < 10: result was missing space to the battery symbol (or non-centered text) when the 12-hour value of the hour became >= 10. Thanks Kota for the bug report! added an option to disable the launcher menu. This is not as easy as it sounds due to Android’s activity stack… Suggestion of Roman, thank you. … and updated the starter “menu” to FloatingActionButtons, which is more international (no texts) and fits much better to material style (and the app’s colors) than buttons. Should be self-explaining. Internal: updated to Build SDK 25 (Android 7) – cross your fingers! One of the advantages: the needed permanent, but unnecessary icon in the notification bar is not visible any more. You can use the Intents “com.chk.permanentclock.DUCK_DISABLE” and “com.chk.permanentclock.DUCK_ENABLE” to show/hide the overlay without changing the active state permanently. These are the same intents used internally for the ducking if a permission dialog pops. Popup menu from launcher shortcut to call the Settings or switch the overlay on or off (permanently) – thank you, Bill, for the idea! Added dummy activities to (temporarily = “duck”) the overlay from external applications (i.e. launcher) without changing the mode, that is, YACO stays active (see ‘ducking’ intents in 1.1.4)!